All the components are easy to clip into the helmet. 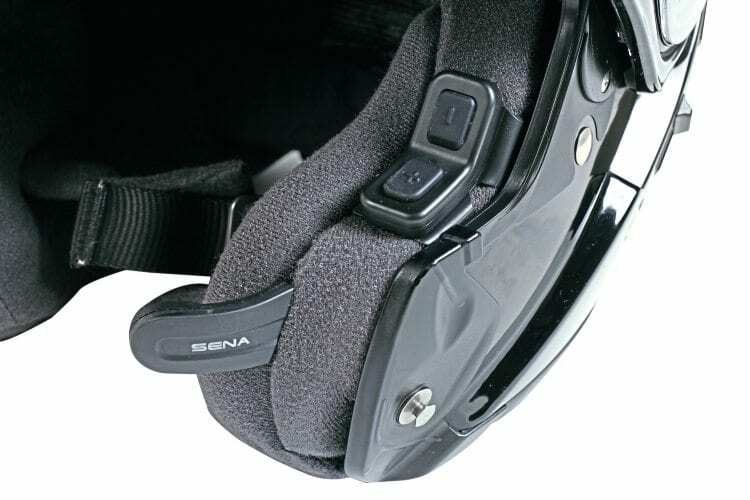 Fitting is simple, with no adhesive needed, leaving a pair of buttons on the left, inside the visor opening (on the outside for the Arai version), with the battery and charging port at the rear skirt. Pressing the buttons together turns the unit on or off, and also, through different durations of press, allows you to control the intercom without the remote control. It’s not ideal, as you need to have the visor open of course, and some of the commands – like switching to the FM radio – require a five-second hold. But the more common uses, like initiating a one-to-one conversation, or playing music from your Bluetooth-connected smartphone, require just a tap or one-second hold. The supplied wireless remote means that – unless you leave it on the wrong bike – you’ll rarely need to use the buttons. Designed to work with the 20S, 10C, 10R, 10S and of course the 10U, the unit is charged with a simple micro USB cable – the same as the intercom. Sena claims a battery life of several months for the remote, and I’ve not needed to recharge mine over what amounts to around 10 hours of riding so far. The idea is to clip the unit – which has a strong spring mechanism – over your left bar. On the open-ended handlebar of the Herald 250 this is okay, but on my KTM 1050 Adventure, which has hand guards, I find my hand is too squashed. Fortunately, it clips between the bar risers on that machine, but it’s worth thinking about where you’ll put it – especially if you like to have plenty of space on the grips during long journeys. I’d prefer the option of a helmet-mounted controller, or something that can be fitted elsewhere on the bike. The remote features two buttons and a joystick, which is also a push-button. This gives complete control of your intercom, but it’s not perfect, and the Herald’s harsh suspension makes it very hard to give the joystick positive commands. Starting the music requires a one-second press of the ‘stick, but my thumb is often bouncing off it, making the Sena look for another intercom instead. It’s the only command I find a problem, and it’s not an issue on any more refined bikes, but music is what I tend to use these devices for most. The battery sits at the bottom rear of the lid. The printed ‘quick guide’ is enough to get it installed and paired with your phone, but you need to download the full user guide online. This can also be viewed in the excellent Sena Android or iOS smartphone app, which lets you change the settings in the unit easily. The 10U allows you to have up to three ‘intercom friends’, to whom you can speak individually, or within a three-way conversation. 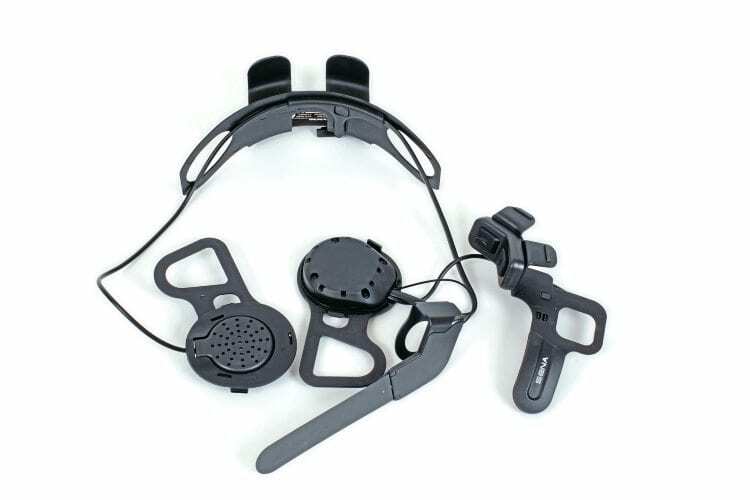 You can have four-way communication with other Sena users by adding another pairing with the second intercom friend. You can even have a three-way conference telephone call – not a feature I want, but you can download the instructions from the Sena website and check that the system meets your needs (www.sena.com). Music can also be shared with an intercom friend, who can then share control (speech isn’t overlaid, so activating the intercom pauses the tunes). The switches and mic are tidily positioned. The range is in line with other systems I’ve used, cutting cleanly in line of sight at 790m, and reconnecting automatically at about 500m. In town it broke off at 390m, returning at 210m, and in a tight housing estate, the signal was lost at just 140m, after turning past a house. The RDS FM radio stores 10 preset channels, along with a ‘temporary preset mode, which is reset when the system is next powered up. It’s easiest to programme your favourites in the app (all settings can be adjusted without a smartphone), and while you’re there, unless you’re not going to be riding very far at all, be sure to turn on ‘RDS AF’ to automatically retune to the strongest signal (it’s off by default). Unfortunately, despite a dedicated, slim antenna, the radio is no better than any other intercoms I’ve used, with quite sketchy reception in all but the strongest signal areas. Not everyone likes being contactable on their bike, but I have my personal phone (not work! ), connected just in case my wife needs me. I also have the three speed-dials set to her numbers. A computer is needed to apply any updates, though mine came with the latest firmware, and you could ask your dealer to help if necessary. 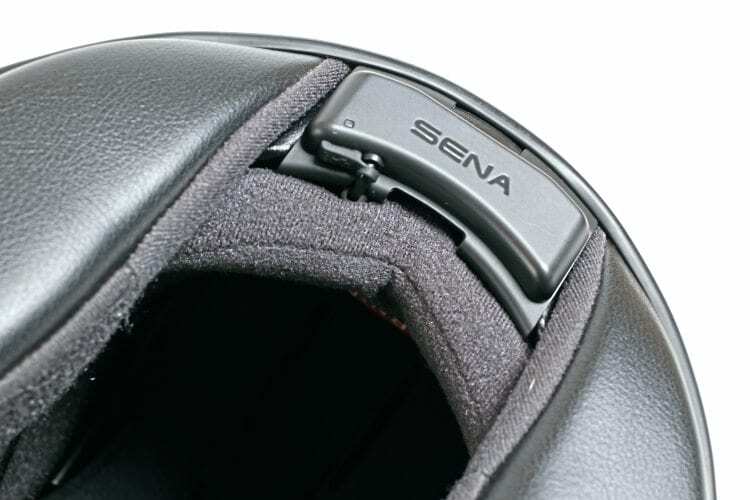 Top marks to Sena for making its devices easily updatable with a PC or Mac. 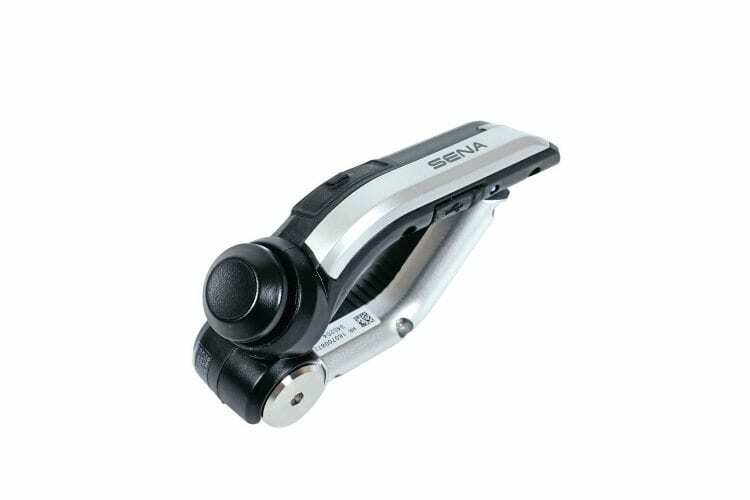 The remote control is included, and allows access to all functions. This is probably the loudest intercom I’ve used, having fantastically clear audio – with my wife paired using a Sena 10S, it sounded as if she was speaking directly over my shoulder. It’s worth pointing out that you should wear earplugs with an intercom to block out helmet noise – I was able to hear Helen at 60-70mph, but as she didn’t have plugs in, she could only hear me up to about 45mph. Sena claims a talk time of 10 hours – I got just under 12 hours of constant music, and while I wish the device would speak the battery level at start-up (like the Interphone), my iPhone displays the battery level whenever it’s connected. Despite some irritations with the remote, the 10U is a superb system – I’ve had no problems in the rain, and it’s the neatest I’ve used, with a very unobtrusive microphone that, unlike most others, doesn’t foul the helmets chin piece, or get in the way of my mouth. 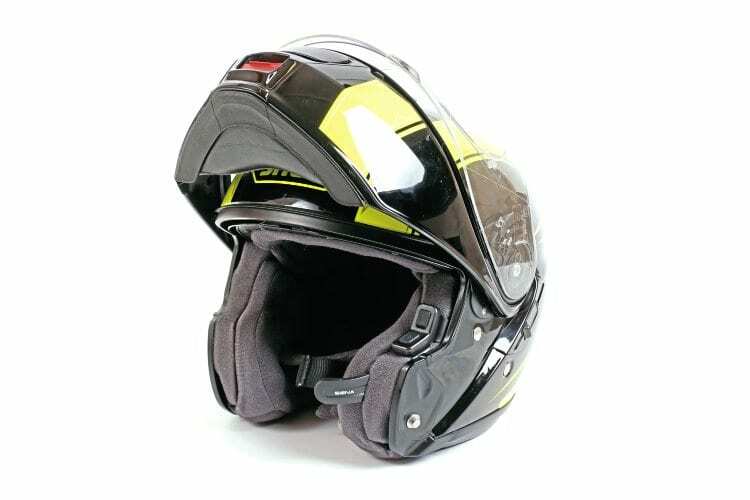 Combined with the superb audio quality, if you have a compatible helmet, it’s well worth a look.